This entry was posted in Uncategorized on April 29, 2014 by Gary. At the beginning of the month I theorized that stocks were about to enter a final bubble phase, and that during that process gold should deliver a capitulation phase to end the three year bear market. This is a follow-up to see how things are playing out now that we have another months worth of price action behind us. 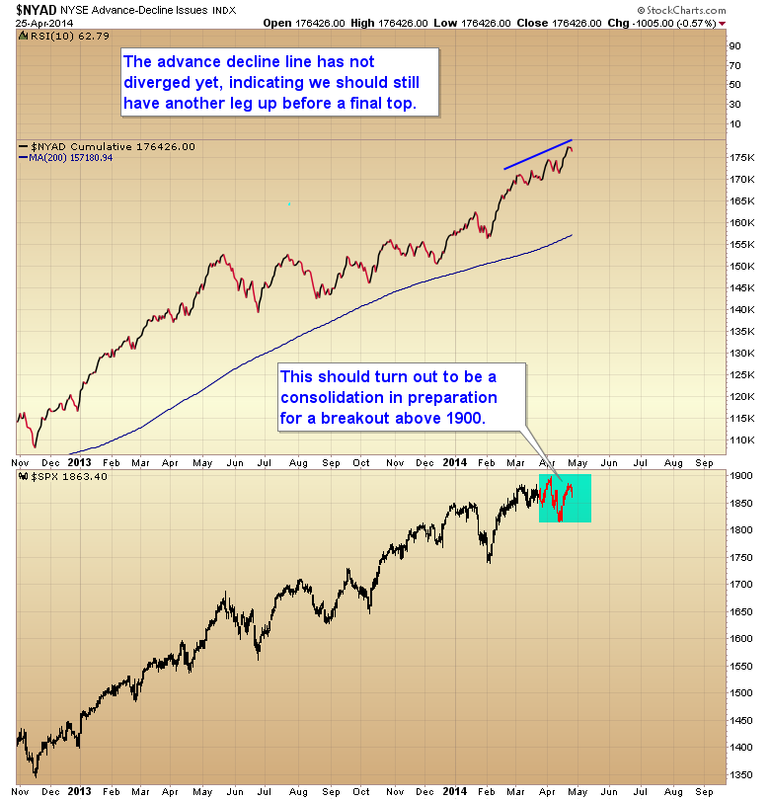 For stocks it still remains to be seen whether or not they have one more surge higher into a final top. 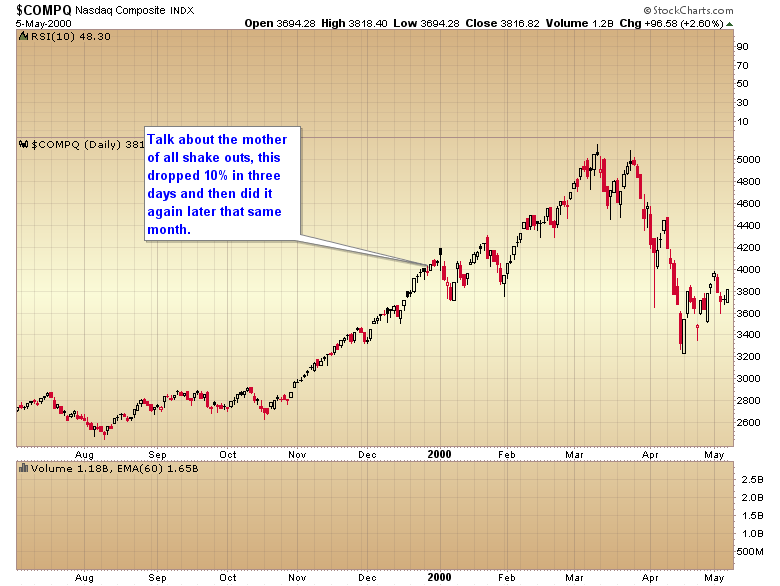 If one just looks at the NASDAQ it would appear that stocks have begun moving down into a bear market. However as I pointed out in my previous article it’s not unusual to have one, and sometimes two very severe corrections before a final leg up in a ending bubble phase. 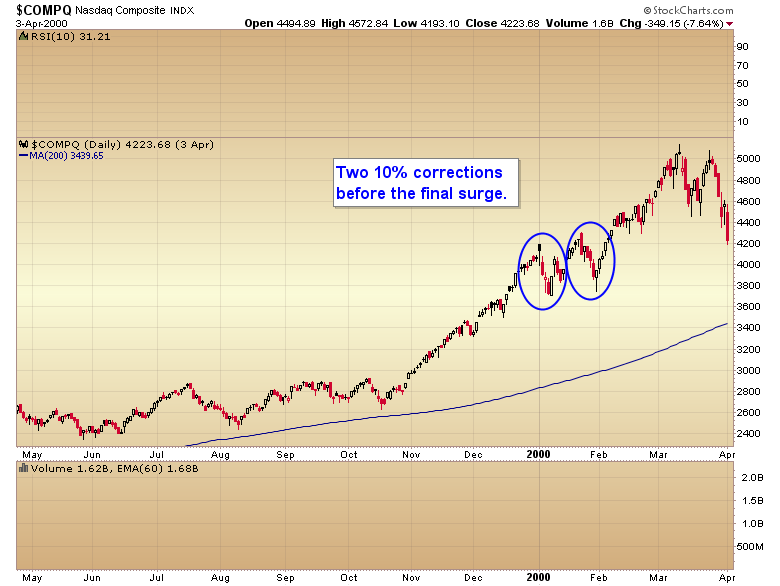 As I pointed out in my previous article the NASDAQ had two back-to-back 10% corrections before a final 34% surge into that 2000 top. So we have to ask ourselves, is the NASDAQ rolling over into a new bear market or is this just a final correction before one more surge higher? From a long-term perspective this looks like just a normal pullback to the 200 a moving average after a particularly powerful move over the last year. I think at this point one still has to give the benefit of the doubt to the bulls. The fact that the advance decline line is still making new highs suggests that this is probably a consolidation in preparation for a break above that 1900 resistance zone. 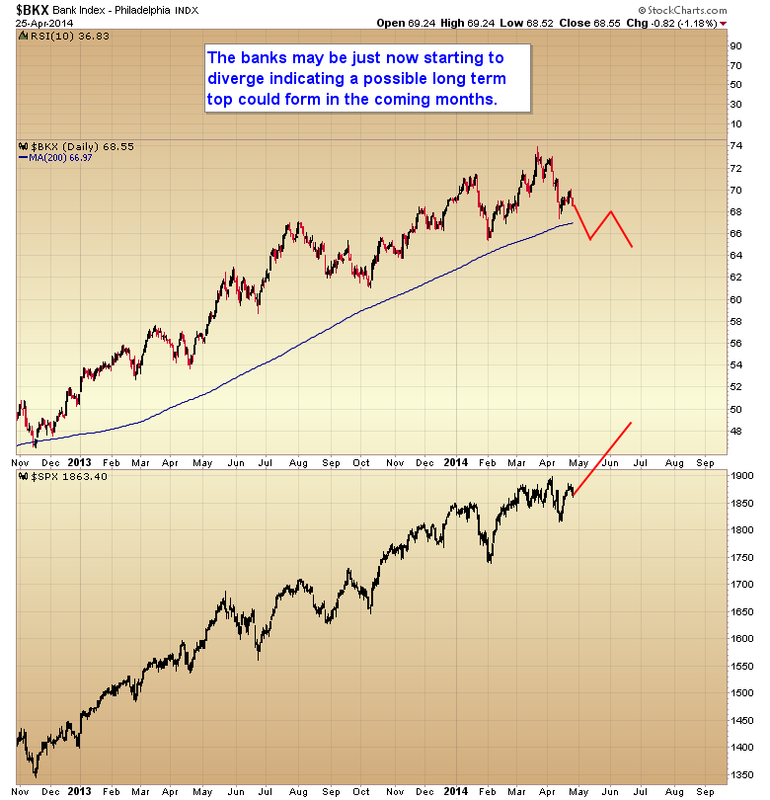 That being said we now have the potential for the banks to start diverging from the general stock market. As I’ve noted in the past it’s not unusual for the banking index to diverge for several months as stocks put in their final top. So if we see the S&P breakout to new highs over the next month or two but the banks continue to lag this would be a strong indication that a final bull market top is forming. As most of you know my thesis for this year was that stocks would put in a final bull market top, probably in the first half of the year, and that during this process liquidity/inflation would begin to leak out of the stock market and move into the commodity markets. We saw that process began in January as the CRB index delivered a strong initial surge and broke through its three-year downtrend line. After this initial surge is complete commodities should move down into a major yearly cycle correction in early summer followed by a much stronger move in the second half of the year. I think that midyear correction has probably begun. As oil is the most important global commodity it tends to drive the general commodity index. So when oil begins to move down into that yearly cycle correction the rest of the commodity complex should eventually follow as they top out one by one and follow oil lower. 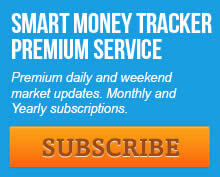 On Friday oil broke below its major intermediate uptrend line from the January bottom. This trend line break should signal that oil has begun moving down into its yearly cycle low. 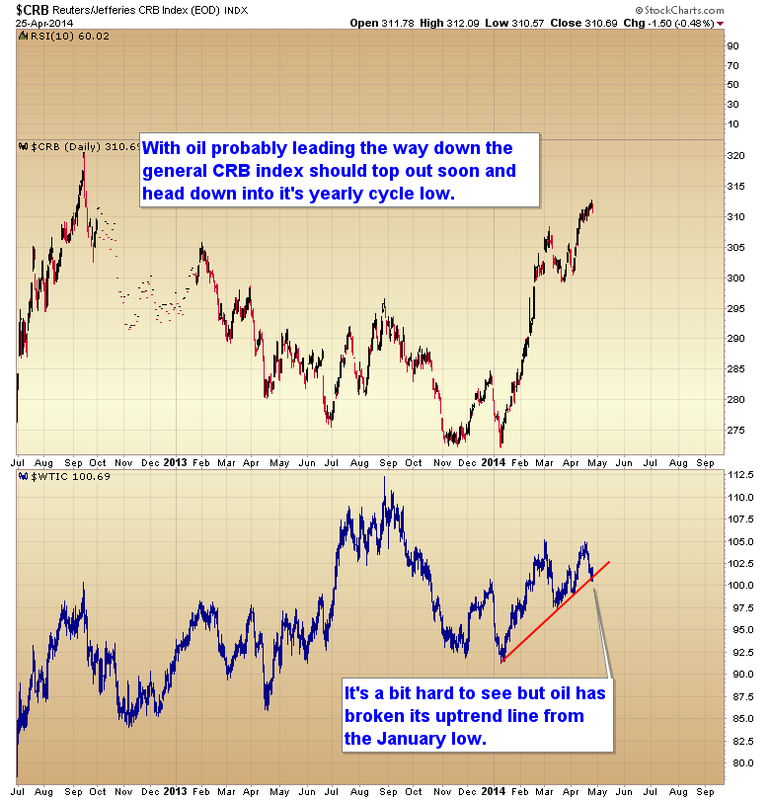 The CRB should soon follow oil lower, and I doubt that it will move above that 2012 high before rolling over into that intermediate degree midyear correction. How does this pertain to gold? To begin with I think the capitulation phase that I theorized in my previous report is probably now off of the table. For that scenario to come to fruition the previous daily cycle needed to drop to the sub $1200 level before bottoming. It looks like gold probably put in that daily cycle low on Thursday at $1268. So does this mean that gold has bottomed and the next bull leg is ready to begin? While it’s possible, I tend to think gold probably still has one more mild leg down before the larger intermediate cycle forms a more lasting bottom. 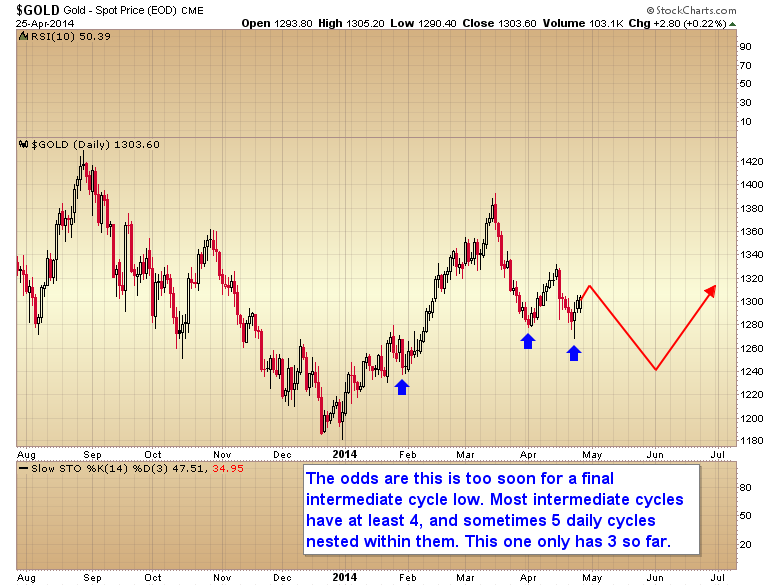 Generally speaking the intermediate cycle in gold usually runs between 20 and 25 weeks. A bottom on Thursday would only be week 16. Also most intermediate cycles have at least four, and sometimes five daily cycles nested within them. As you can see in the chart below the current intermediate cycle only has three daily cycles so far. Unless gold can do something to confirm a short intermediate cycle I think we have to assume gold still has one more daily cycle down before this intermediate decline is complete. Now that the capitulation phase is probably off the table I think the most likely target for a final intermediate bottom would be in the $1260-$1240 range somewhere around the end of May or beginning of June. If however gold were to rally very quickly back above the $1331 level by the end of next week then we could entertain the idea of a short intermediate cycle and a final end to gold’s three-year bear market. This scenario would probably require that the stock market has put in a final bull market top, and as I noted at the beginning of this article, I’m not convinced that has happened just yet. I tend to think the moves in stocks and gold recently have been greatly influenced by the tensions in Ukraine. If conditions improve I would expect stocks to resume their trend higher and gold to continue down into a normal duration intermediate bottom in late May or early June. Over the next 1-2 months commodities should move down into that midyear correction in preparation for a very powerful move up during the second half of the year. Gold should follow the rest of the CRB index down into that yearly cycle low, but I will keep an eye on it over the next week or two as the situation in Eastern Europe may push gold into a divergent path from the rest of the commodity complex. This entry was posted in Uncategorized on April 26, 2014 by Gary. This entry was posted in Uncategorized on April 22, 2014 by Gary. This entry was posted in Uncategorized on April 21, 2014 by Gary. This entry was posted in Uncategorized on April 18, 2014 by Gary. This entry was posted in Uncategorized on April 16, 2014 by Gary. This entry was posted in Uncategorized on April 15, 2014 by Gary. This entry was posted in Uncategorized on April 9, 2014 by Gary. After two hard days down in the stock market I’m going to take a contrary position and say that this is just a normal profit taking event and that stocks are going to recover and head back up to new highs. I still think this market needs to have a final blowoff bubble phase before the bull can die. 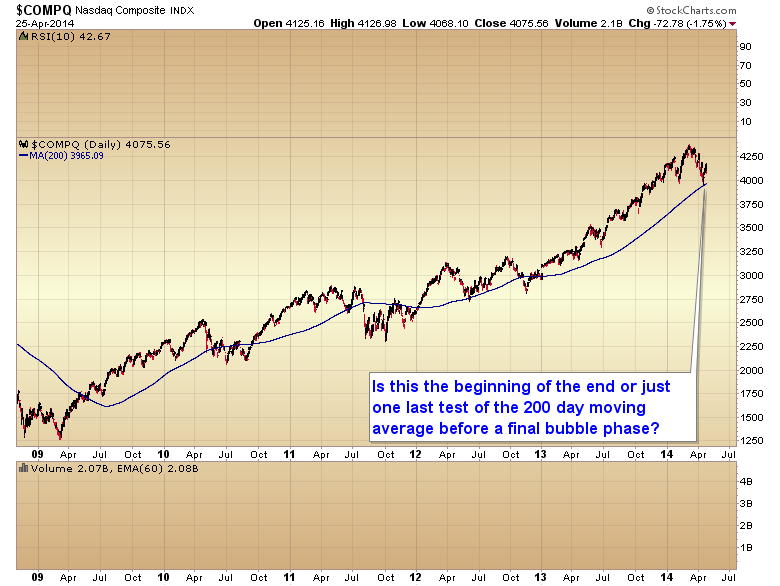 The final bubble phase for stocks should usher in the final capitulation stage of golds 2 1/2 year bear market. For those like SMT subscribers that are sitting in cash, this final capitulation is going to represent one of the greatest buying opportunities of this generation. We’ve had so many calls for a crash over the last year that you just know the bears are salivating right now thinking they are finally going to get their wish. However, I don’t think we can have a crash in the stock market until we complete a true parabolic structure. Notice that during the final parabolic move in 2000 the NASDAQ had two back-to-back 10% corrections, one of them unfolding in only three days and completing what looked like at the time a double top. The shorts that jumped in at the bottom of that second 10% correction then got absolutely destroyed over the next six weeks as the tech sector proceeded to rally 34%. We saw a very similar pattern during oils parabolic advance in 2008. 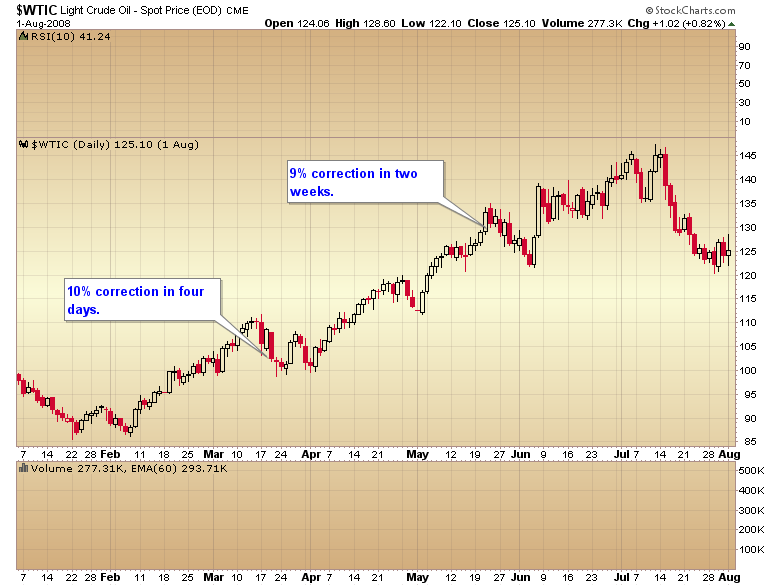 Two very convincing 10% corrections followed by a 5 to 6 week surge into a final top. The fashionable call right now is that the big momentum names like Facebook, Priceline, Tesla, Netflix, etc. are leading the market into a new bear. I on the other hand think these stocks are just pulling back in preparation for one final mind blowing surge to top off this five-year bull market. Gold on the other hand looks like it is setting up for a final bear market capitulation phase where every gold bug finally throws up their hands in disgust and jumps over to the stock market right as it’s putting in a final bubble top. 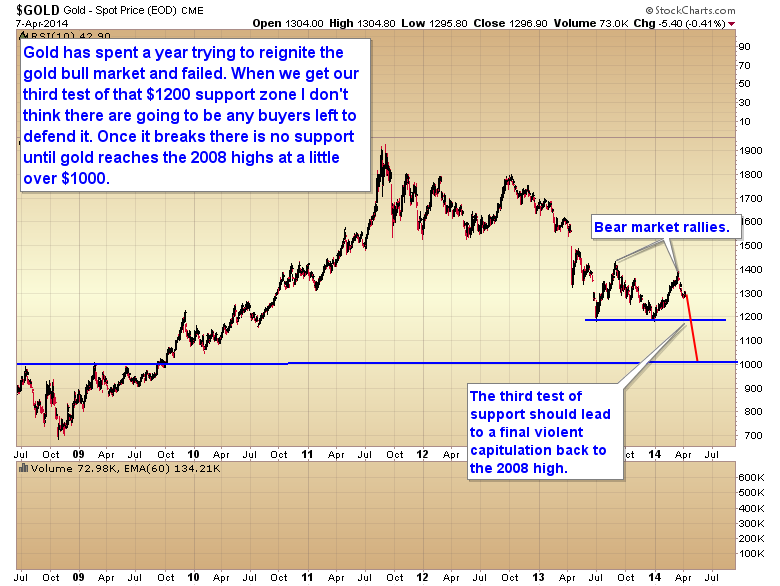 It’s now been a year since gold broke through that $1520 support zone and gold has yet to ignite a new bull market move. We’ve had two very convincing bear market rallies but both have rolled over at that same $1400 level. I’m afraid this has probably so demoralized precious metal investors that when we get our next test of that sub $1200 level later this month there just aren’t going to be any buyers left to defend that level. A third test of that support will almost certainly end in a break and final violent capitulation down to the next support zone at the 2008 high a little above $1000. As gut wrenching as it is for me to say this, this final capitulation will probably shave another 30-50% off of the mining stocks and bankrupt many of the juniors. There have been numerous warning signs over the last two weeks that the gold bear might not be done just yet. If we had seen a final bear market bottom on December 31 the miners should have rallied at least 75 to 100% in the first two months. Well two months went by and the best that the HUI could deliver was a 35% gain. 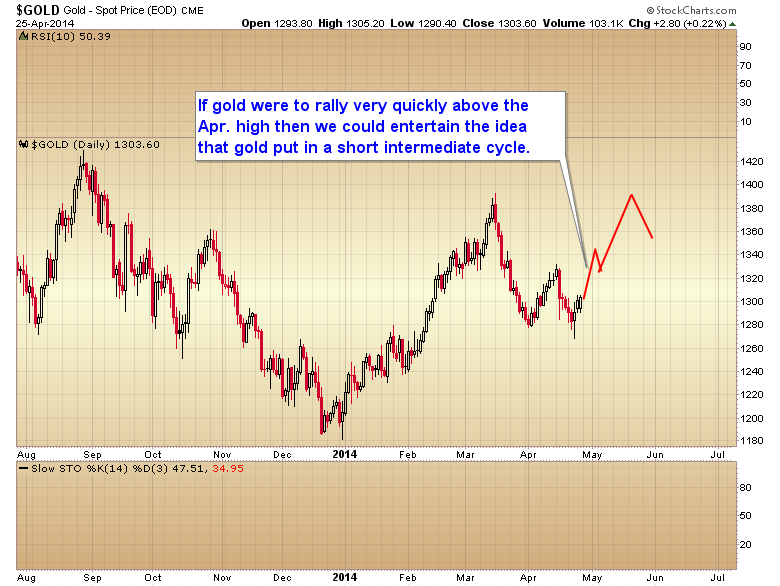 Also when gold failed to move above $1434 it set the yearly cycle up in an extreme left translated pattern. For those that don’t know what translation is let me explain. 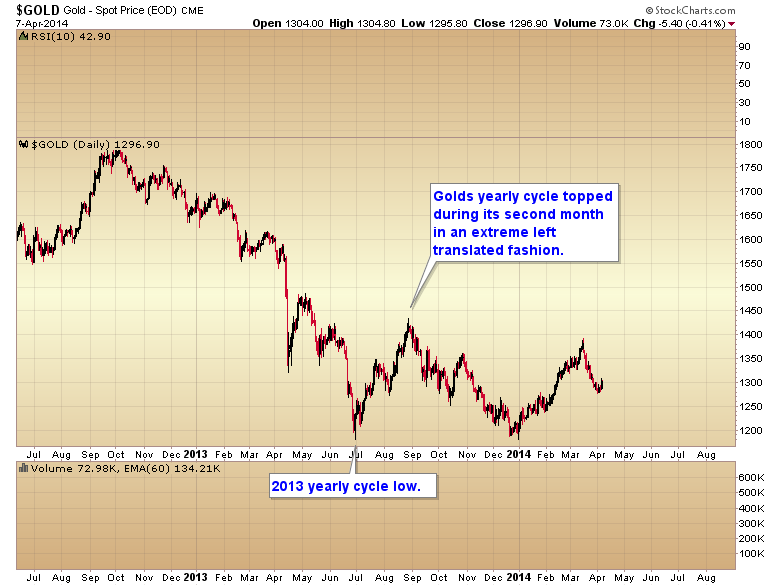 Golds yearly cycle for instance typically runs about 12 months from trough to trough. A cycle that tops in a right translated manner would find a high somewhere after the seventh month. A left translated cycle on the other hand would find a final top in six months or less. So if a cycle runs 12 months and tops in a left translated fashion on let’s say month four it has eight months to decline. Much longer than the four months it rallied. So consequently, left translated cycles typically move below the previous cycle low. 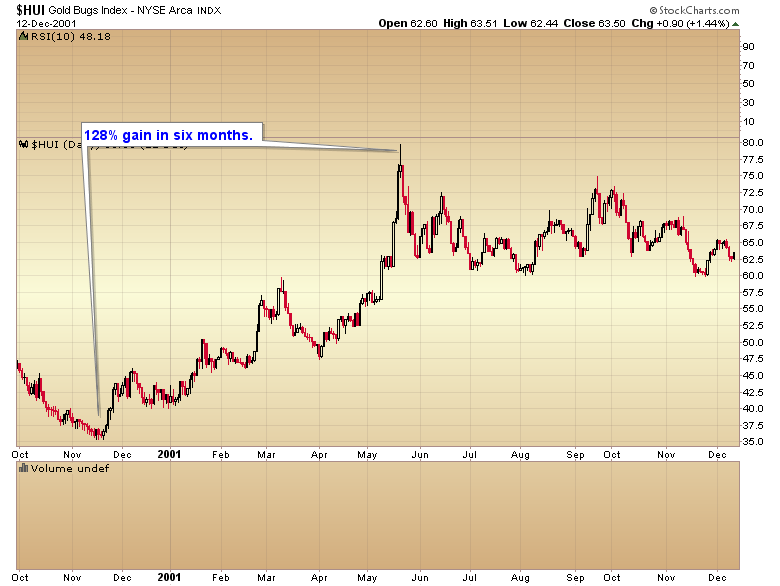 As you can see in the chart below golds yearly cycle topped in an extreme left translated pattern on month #2. As I have noted in previous reports gold is now moving down into an intermediate degree bottom, and this intermediate bottom will also be a larger degree yearly cycle bottom. The magnification of those two larger degree cycles coming together at the same time should create an exceptionally violent and aggressive move over the next 4-8 weeks. The risk is very high that gold is going to break that double bottom support over the next 1 to 2 months, and when it does I don’t think anything will stop the decline until it reaches the next major support zone a little above $1000. That’s the point at which investors that have available cash will get the third great buying opportunity of this secular bull market. The first two delivered amazing gains as they came out of their bear market bottoms. This coming bear market bottom will be no different, and it might be even more intense than the other two as it should kickoff the final 2-3 year bubble phase of the secular gold bull. For those that have the mental fortitude to buy at the impending bottom when it looks like the entire sector is going to collapse forever, this is where millionaires and billionaires will be made. Remember bear markets create opportunities. The bigger the bear, the bigger the opportunity. Just look at the recent bear market in stocks as an example. At the bottom in 2009 the stock market bear was the second most damaging in history. 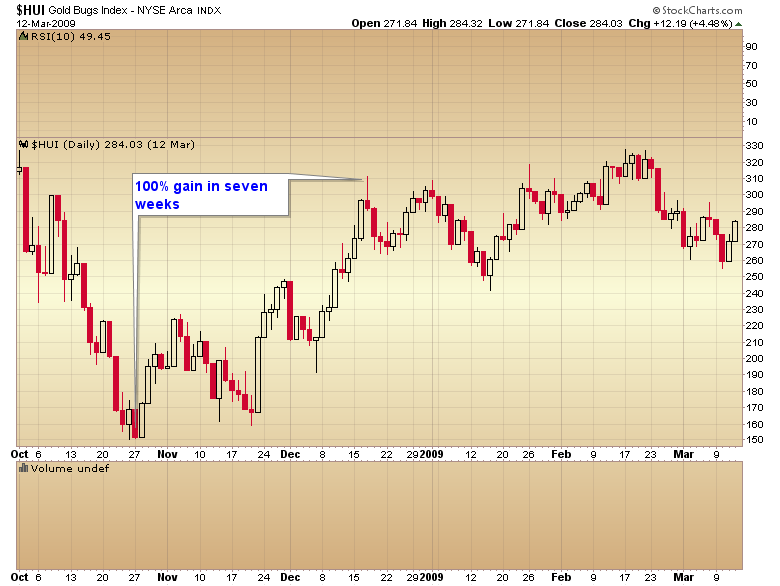 It generated a five year bull market that has rallied 185% and I don’t think it’s done yet. Once the current counter trend rally is finished, and I don’t really expect it to get through resistance at $1320-25, gold should head down into its final bear market bottom. I look forward to trying to call that final bottom in real time over the next couple of months. This entry was posted in Uncategorized on April 8, 2014 by Gary. This entry was posted in Uncategorized on April 4, 2014 by Gary.